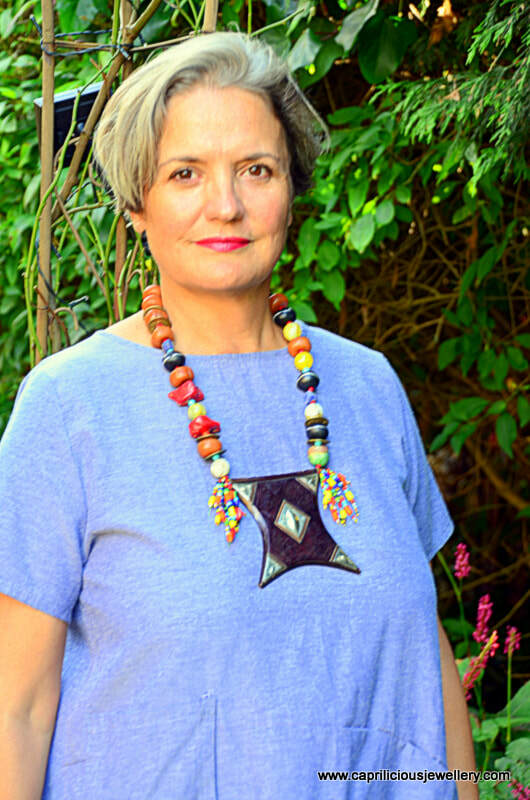 For the Thoroughly Modern Millie - bright, cheerful and contemporary ethnographic jewellery to delight the eye - one of a kind pieces that draw their inspiration from the Dark Continent. 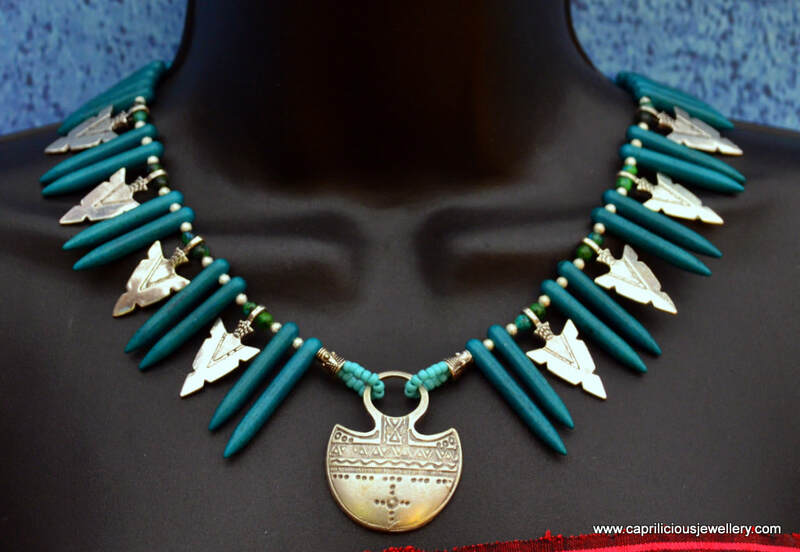 25" long, this necklace carries a Tcherot Tuareg amulet, to keep you safe on your journeys. 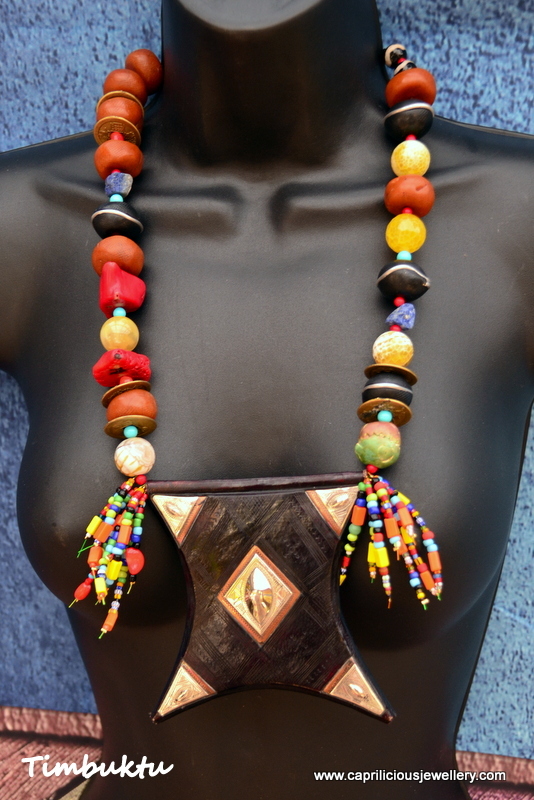 The pendant is 5.5 x 4.5" made of tooled leather, silver and copper.The necklace has faux amber and ebony prayer beads of polymer clay, made at Caprilicious, real bamboo coral nuggets, lapis lazuli nuggets, and yellow fire agate beads and a few Chinese coins, with spacer beads of shell pearl, coral and howlite. 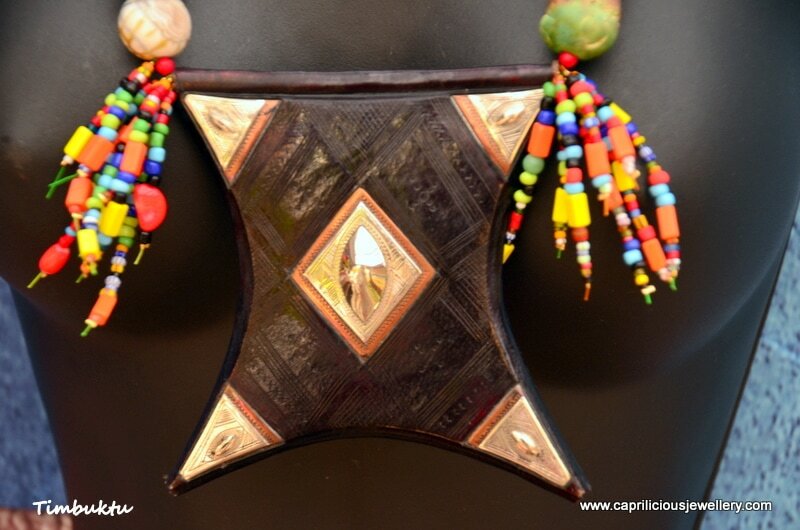 Tassels of African Trade beads and ceramic beads have been attached to either side of the pendant. 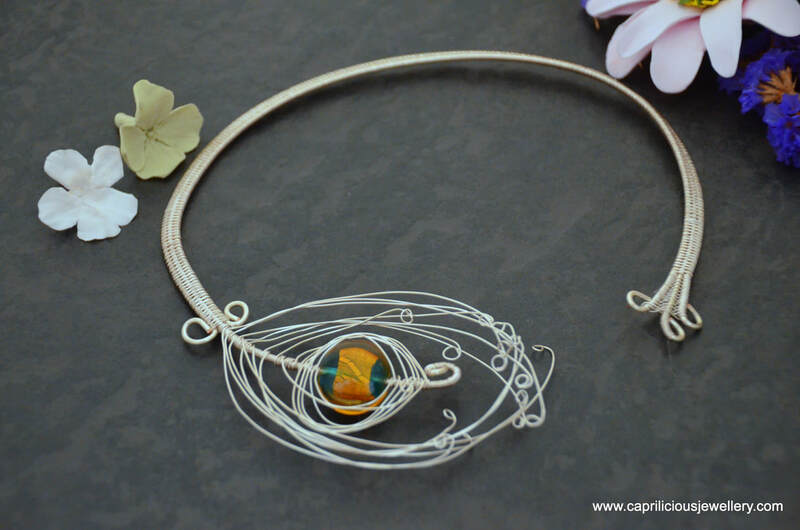 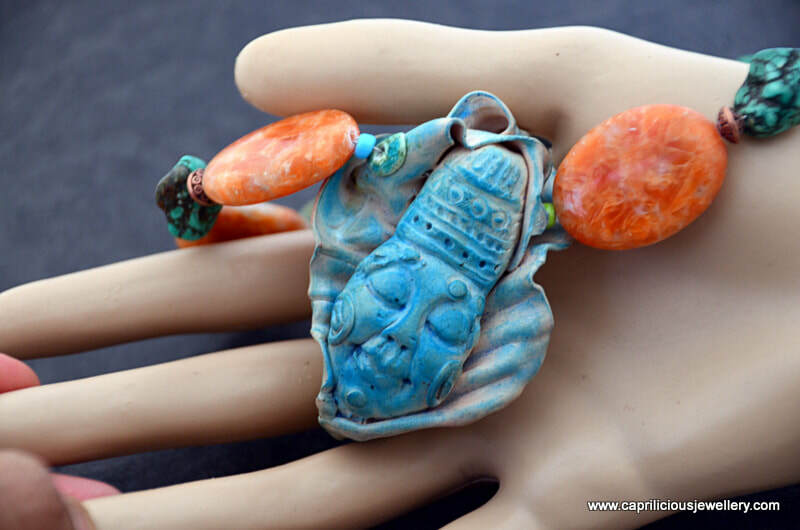 A very interesting and unusual piece of jewellery. An Oshun is a Yoruba Orisha of the sweet or fresh waters. 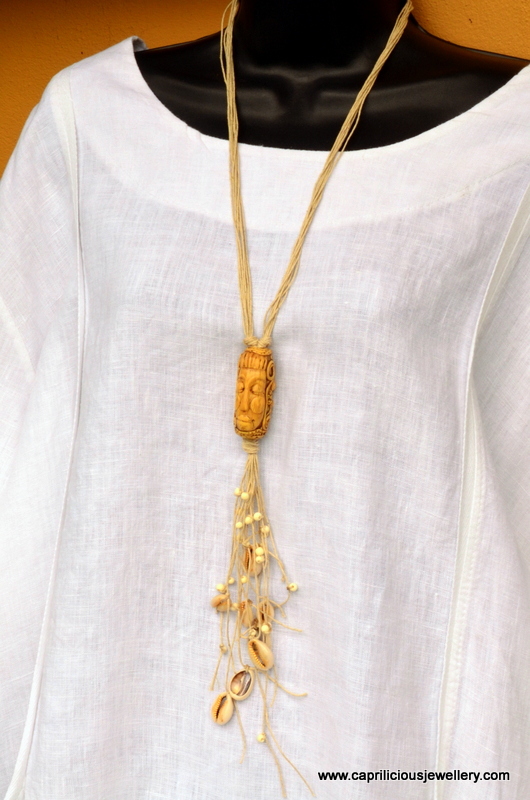 She is widely loved, as she is known for healing the sick and bringing fertility and prosperity, watching over the poor and bringing them what they need. 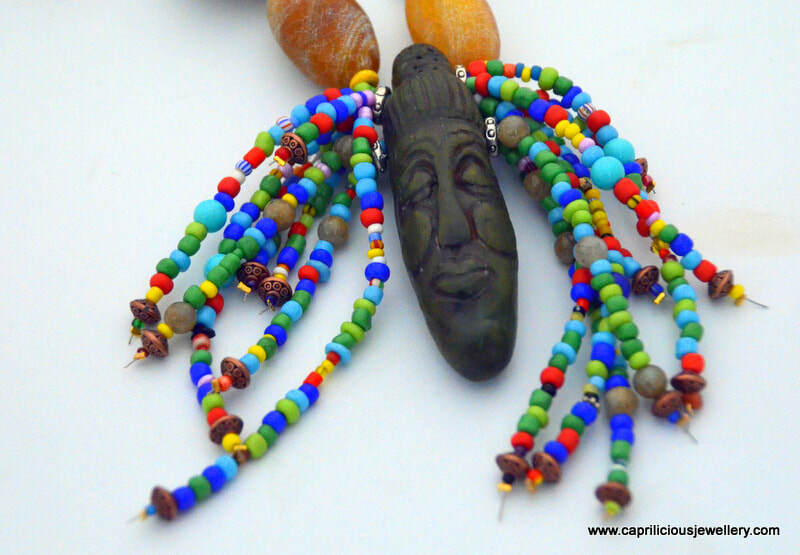 As Orisha of love, Oshun is represented as a beautiful, charming and coquettish young woman. 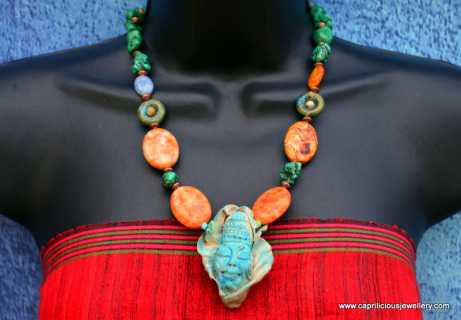 In some tales, she is said to be a mermaid, with a fish's tail. 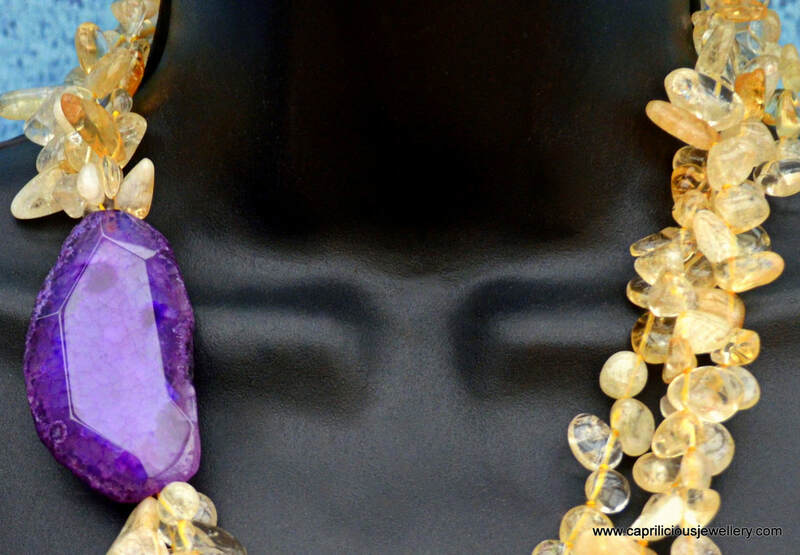 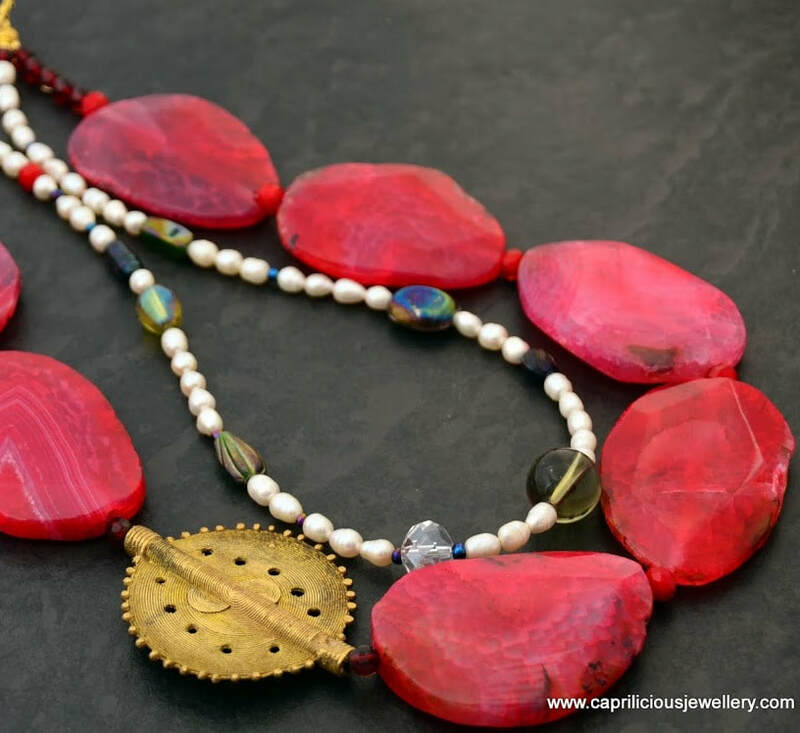 A stunning handmade necklace dedicated to Oshun, the African river goddess of luxury and pleasure, sexuality and fertility, beauty and love. 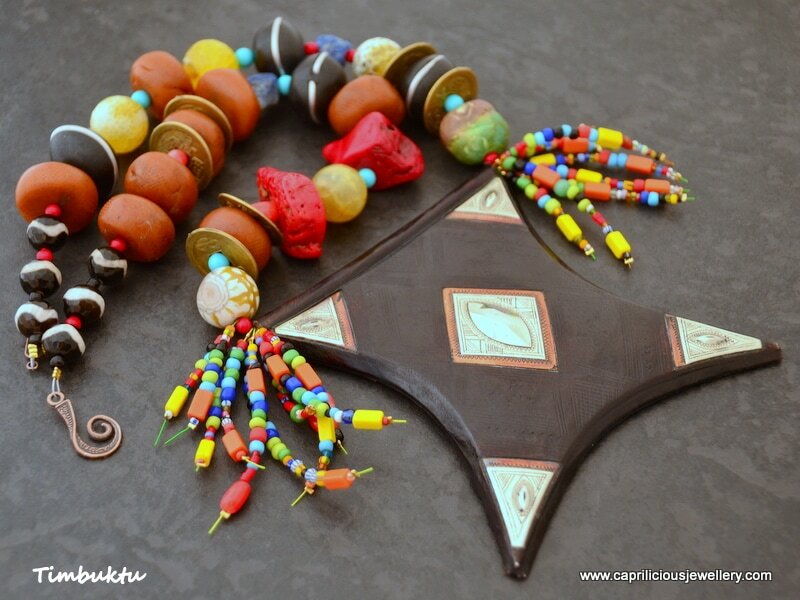 A polymer clay faux ebony pendant, aged and soulful has colourful seed bead tassels on either side. 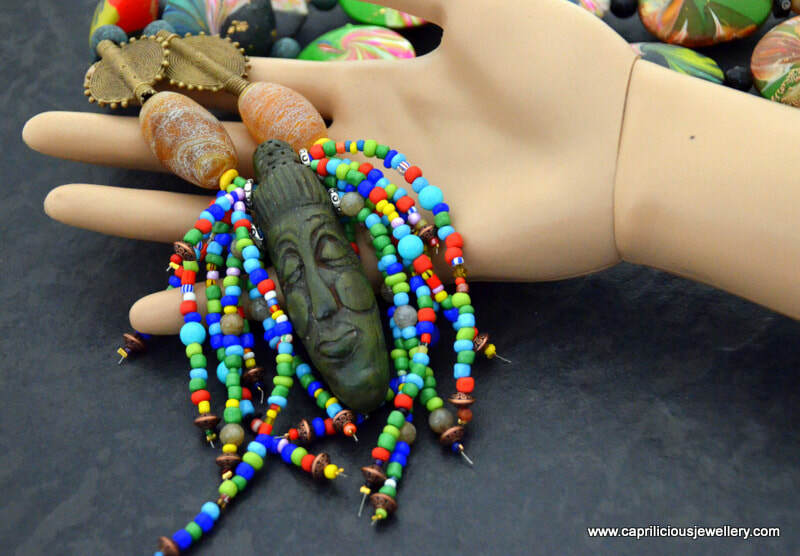 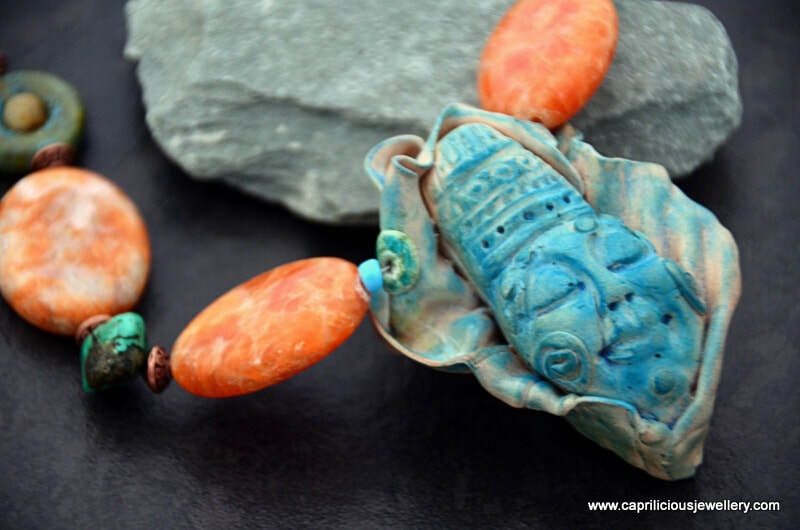 The beads are handmade polymer clay and agate interspersed with rustic ceramic beads from Greece and bronze sun beads from Kenya. 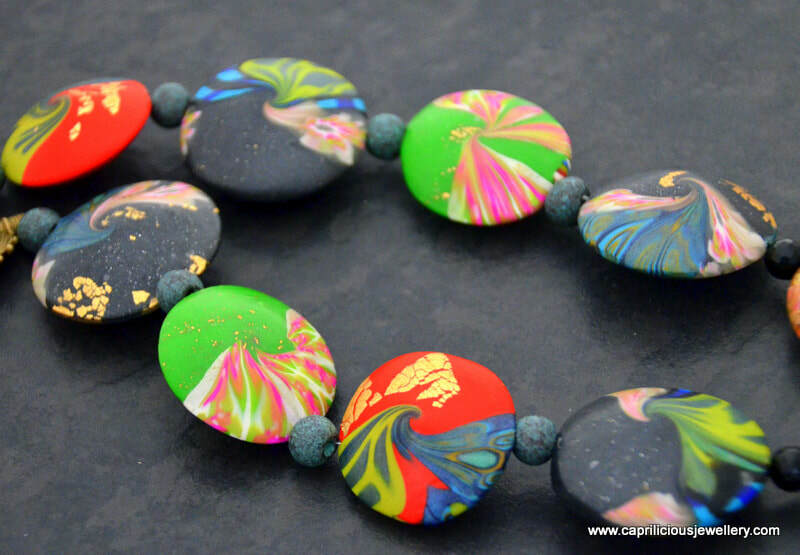 The colourful polymer clay beads are embellished with gold foil in what I call 'cosmic bead' fashion, as the gold foil looks mysteriously like a starlit sky. 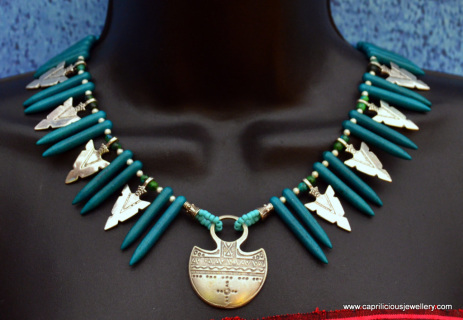 A strong toggle clasp to finish a necklace that is about 25" long. 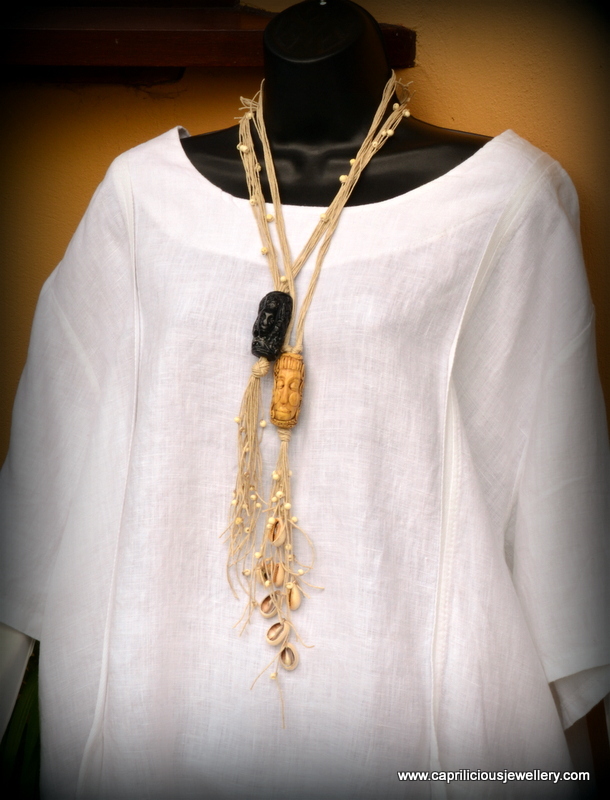 Wear it with your summer gear, white shirts, T-shirts and lagenlook clothing to blow people away and sizzle this summer and over jumpers in drab winter weather to cheer yourself up, A necklace for the brave who dare to be interesting and to not follow the herd! 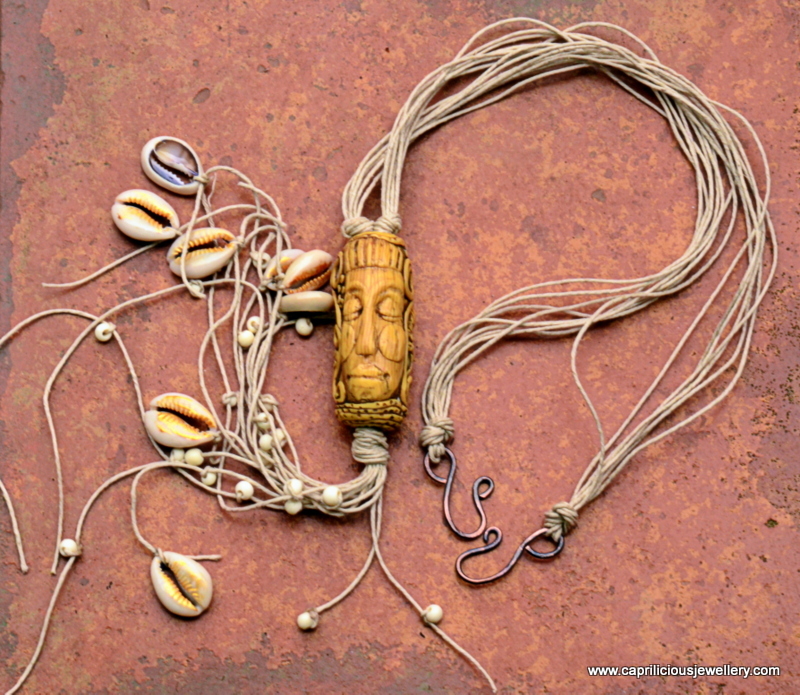 A long waxed linen necklace, festooned with cowrie shells and small bone beads, finished with a handmade patinated copper clasp. 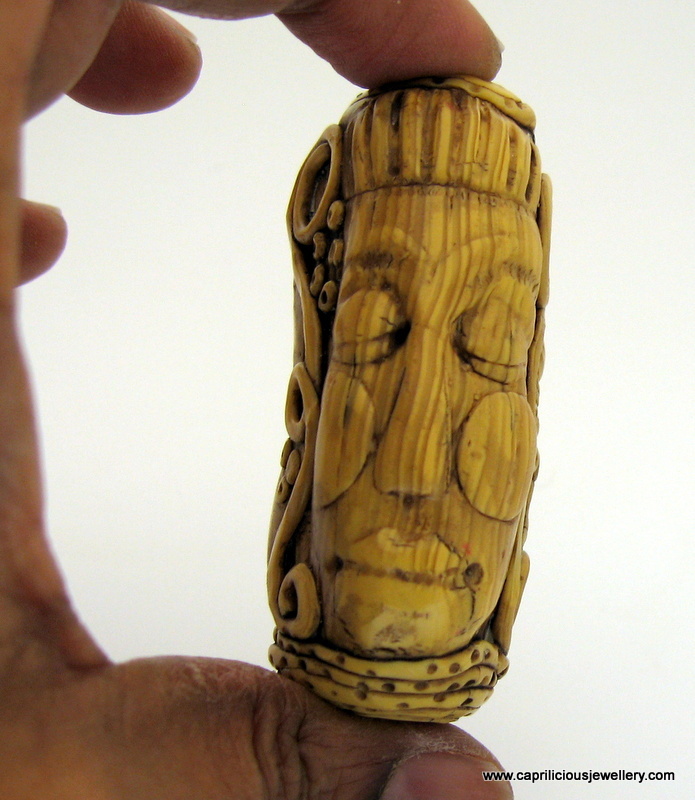 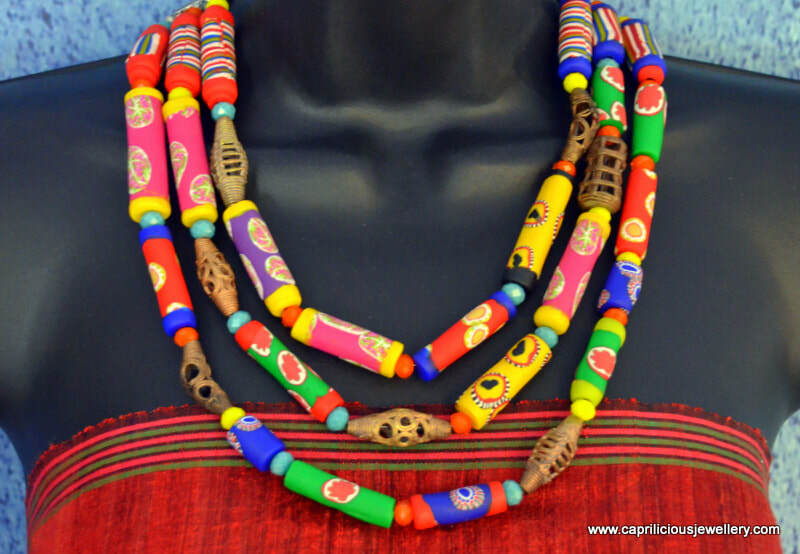 The focal is a faux bone bead, with serene tribal faces and jungle fruit flowers and leaves carved into it. 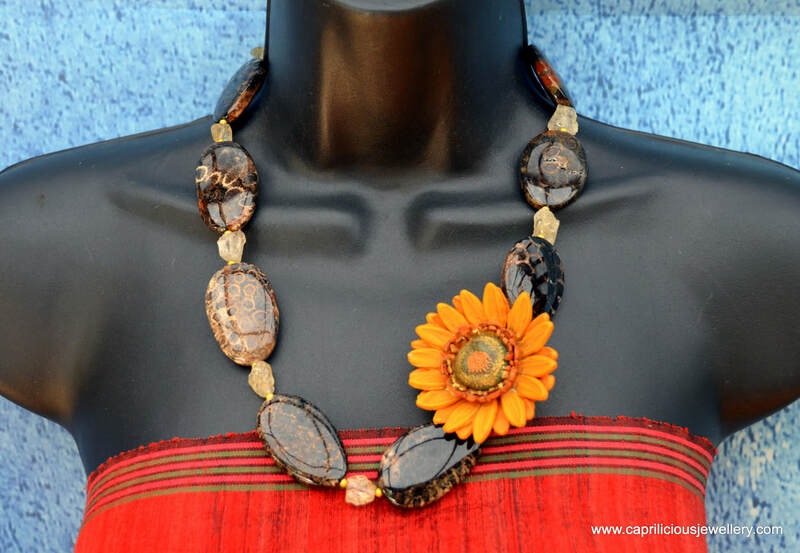 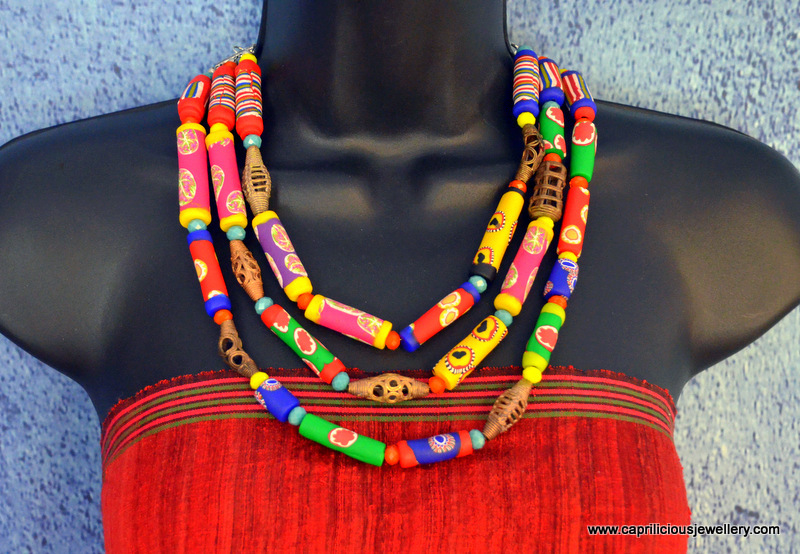 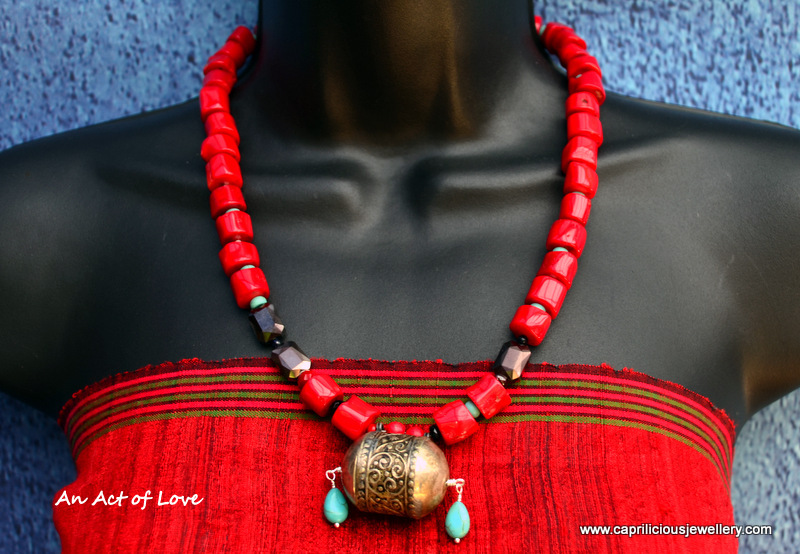 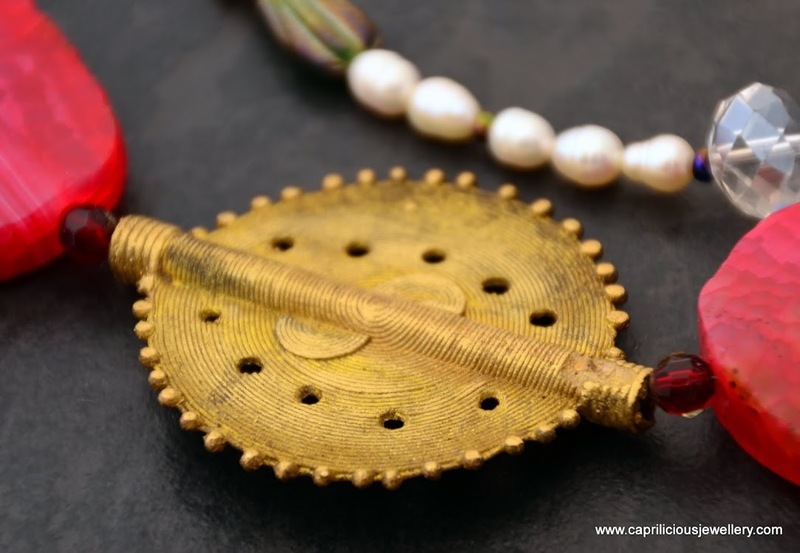 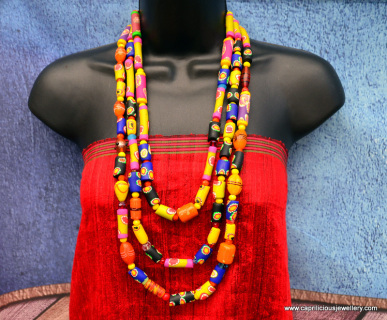 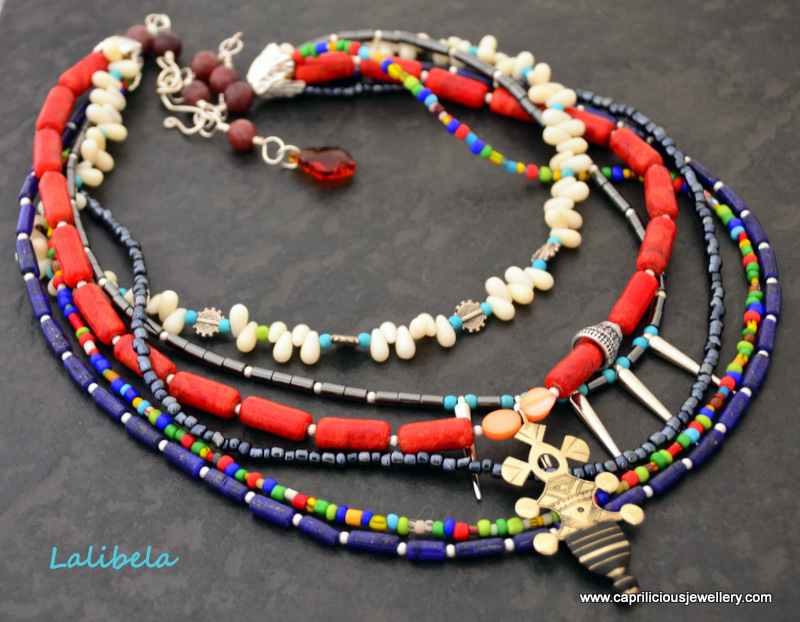 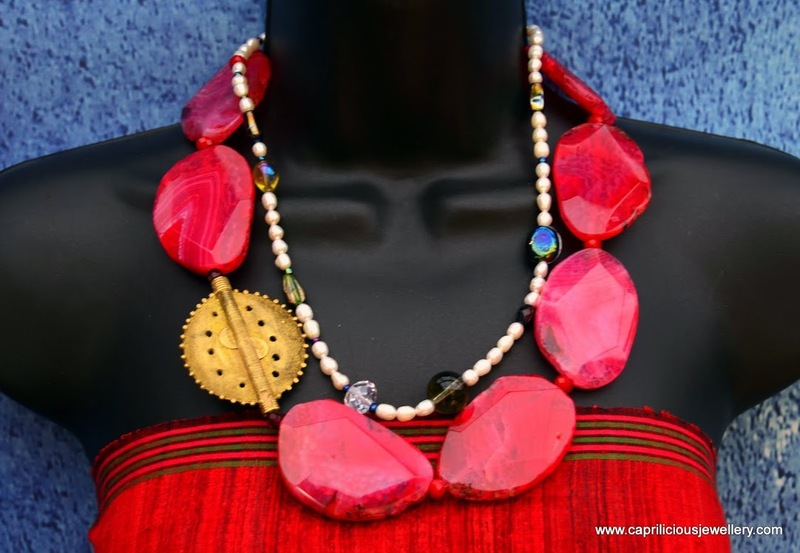 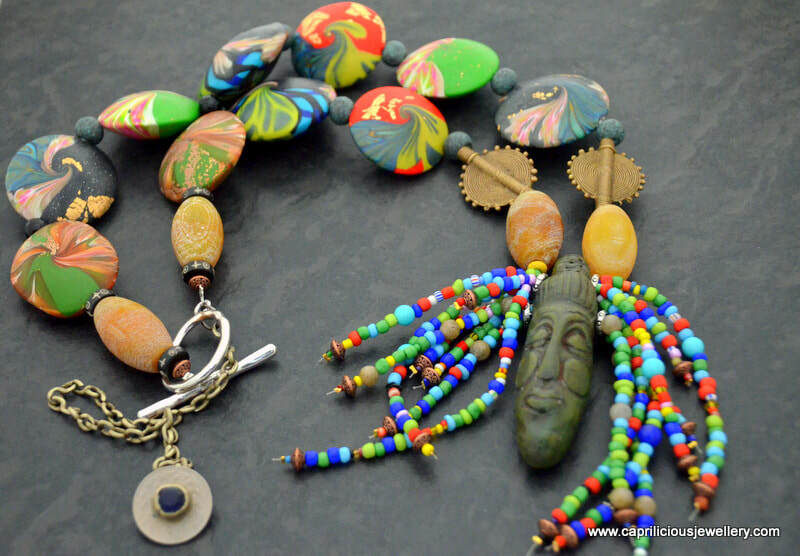 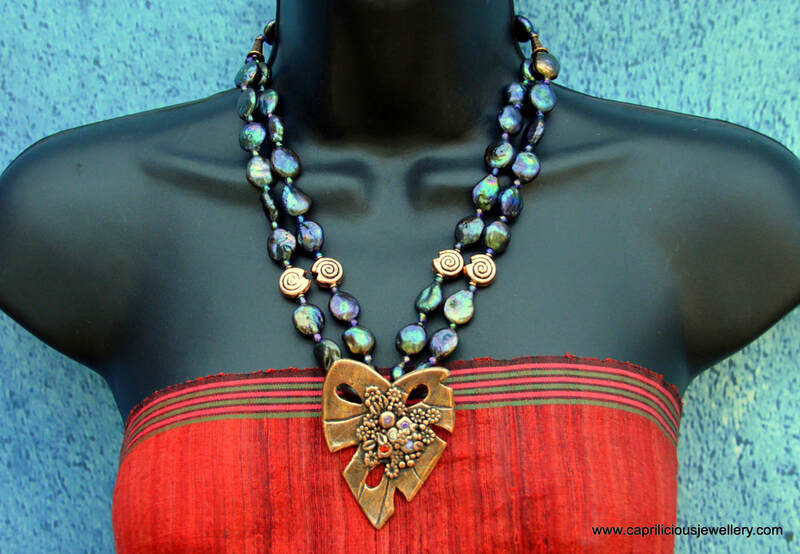 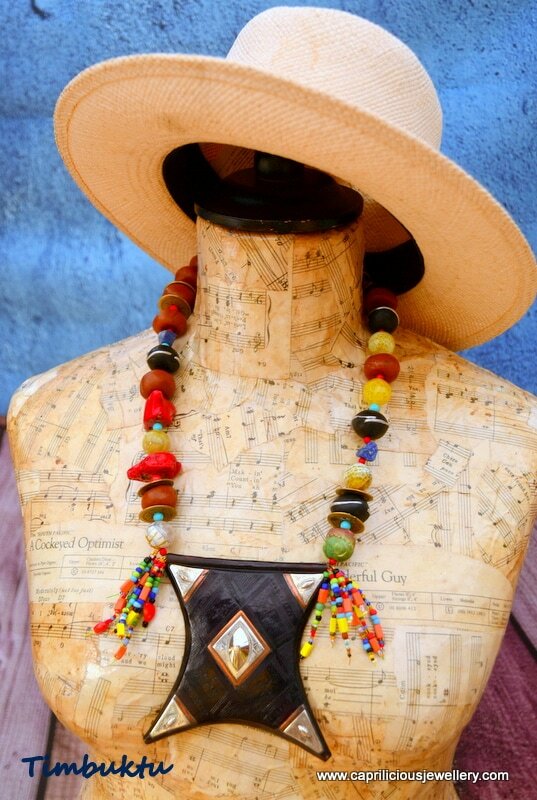 Get ready for your summer linens with this tribal look necklace. 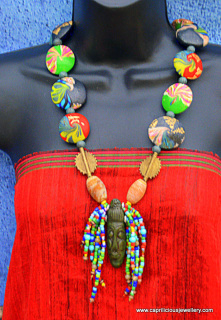 Wear it this summer for a relatively inexpensive but chic tribal look that is all the rage today. 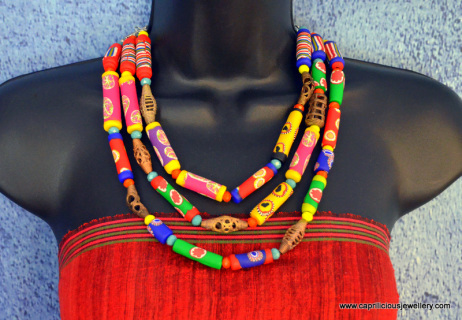 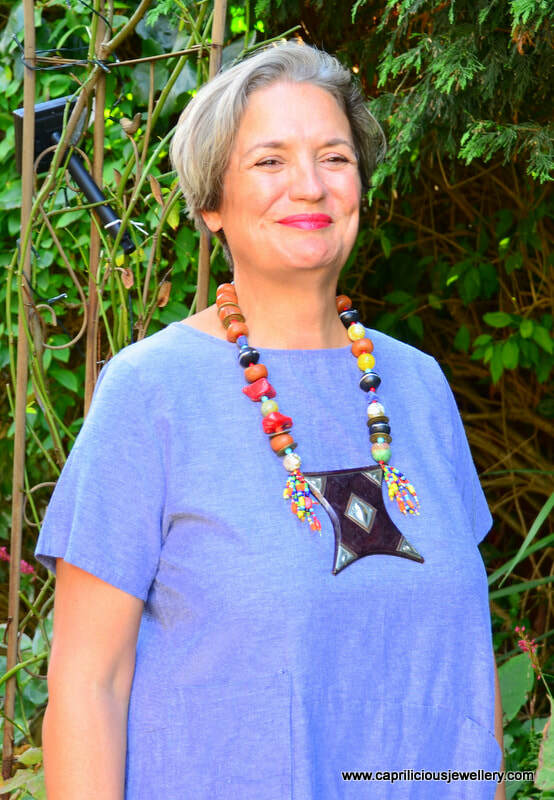 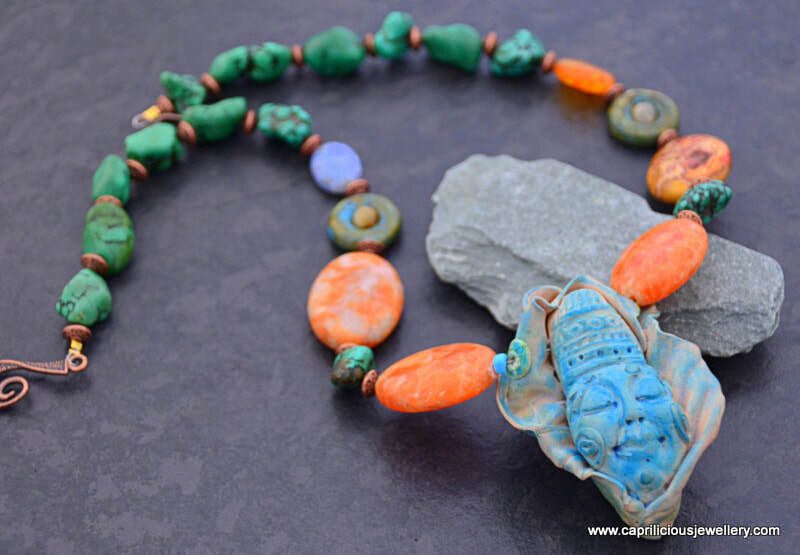 A vivid tribal necklace with a gaily coloured Moroccan enamelled bead this necklace is all things bright and beautiful. 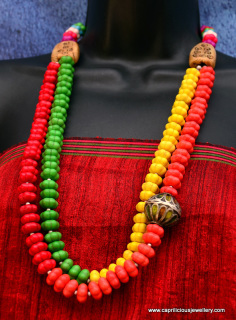 23" long, 2 rows in colour blocks of red and orange, green and yellow Howlite colour treated pumpkin shaped beads held by handmade faux bone polymer clay connectors, on a toggle clasp.